Description : South Beach Restaurant Guide is a virtual guide, dedicated to bringing South Beach restaurants to a world-wide audience via the Internet. South Beach Restaurant Guide specializes in visually highlighting menu items, allowing people to see the presentation South Beach restaurants are famous for. Working with South Beach Restaurant Guide, South Beach Web Sites recently introduced revolutionary new technology, driving the cost of database-enabled web sites down dramatically. 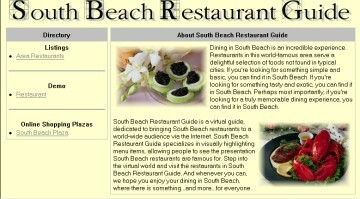 Web sites developed by South Beach Web Sites will be included in South Beach Restaurant Guide for no additional charge. But even more importantly for business owners, you can have your own domain name, your own standalone web site, and your own email accounts...also at no additional charge. For more information, visit www.southbeachrestaurantguide.com.